An evocative tale of ancient magic, bravery, and family bonds. Fionn Boyle comes from a long line of brave seafarers, people with the ocean behind their eyes. But he can’t help but fear the open sea. For years, Fionn's mother has told him stories of Arranmore Island, a strange place that seems to haunt her. Fionn has always wondered about this mysterious island, and from the day he arrives he starts noticing things that can't be explained. He can sense the island all around him, and it feels like the island is watching him, too. Once in a generation, Arranmore Island chooses a new Storm Keeper to wield its power and keep its magic safe from enemies. The time has come for his grandfather, a secretive and eccentric old man, to step down. But as Fionn and the other descendants of Arranmore’s most powerful families fight to become the island’s next champion, a more sinister magic is waking up, intent on rekindling a long-ago war and changing Fionn’s life and the island’s future forever. Catherine Doyle grew up beside the Atlantic Ocean in the west of Ireland. Her love of reading began with great Irish myths and legends, and fostered in her an ambition to one day write her own. 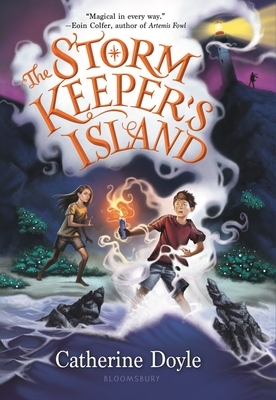 The Storm Keeper's Island is her debut middle-grade novel and was inspired by her real-life ancestral home of Arranmore Island (where her grandparents grew up), and the adventures of her many sea-faring ancestors. After living in Dublin City for two years, Catherine is now based in Galway but spends a lot of her time in the US and London.